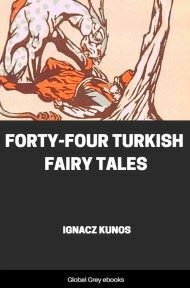 This book draws on the rich folklore of Turkey with forty-four Turkish Fairy Tales. Most of these stories are framed by the usual fairy tale apparatus. There are quests to win the hand of a princess, evil step-relations, talking animals, magical objects and transformations, simple (but brave) peasants, wizards and witches, dragons and dungeons, thousand-league journeys, and loveable fools. 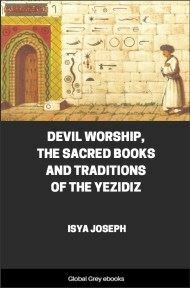 The majority of these stories contain encounters with Turkish supernatural beings. These are called 'Dews,' known elsewhere in Islamic folklore as 'Devis,' or 'Jin,' Europeanized as 'Genie.' 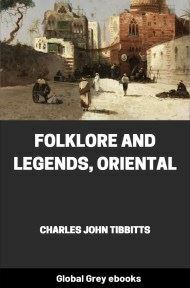 (Sometimes in this book, the Turkish Dew are also called 'Arabs!') These most resemble the giants of European folk tales, with elements of the fairies. The Dews are, more often than not, malevolent towards humans, although they occasionally help the protagonist in their quest. Note: some of the illustrations would be considered unsuitable by contemporary standards because they are caricatures with obvious ethnic stereotypes. However, in most cases, the illustrator is portraying imaginary creatures, which are supposed to be grotesque. ALLAH, the most gracious God, whose dwelling, place is the seventh heaven, completed the work of creation. Seven planes has the heaven and seven planes also the earth--the abode of evil spirits. In the heavenly ways reside the peris, or good spirits; in the earthly darkness the dews, or evil spirits. The light of heaven is in conflict with the darkness of earth--the peris with the dews. The peris soar to heaven, high above the earth; but the dews sink down into the darkness under the earth. Mountains bar the road to heaven, and only the good spirits can reach the Copper Range, whence the way is open to the Silver Mountains and the Hills of Gold. Evil spirits are blinded by the ineffable radiance of heaven. Their dwelling place is the depths of the earth, the entrance to which is at the spring of waters. There tarry the white and the black sheep, into whose wool the evil spirits penetrate, and are so conveyed to their realm on the seventh plane. On the white sheep they return to the earth's surface. Peris and dews are powerful, and both were witnesses of the creation of earth's original inhabitant, the First Man. Allah created the First Man, and appointed him the earth for his dwelling-place. And when the First Mortal appeared upon the earth and the peris rejoiced over Allah's wonderful work, the Father of Evil beheld it, and envy overcame his soul. Straightway he conceived a plan whereby to bring to nought that beneficent work, He would implant the deadly seed of sin in this favoured creature of the Almighty; and soon the First Man, all unsuspecting, received on his pure body the damnable spittle of the Evil One, who struck him therewith in the region of the stomach. But Allah, the all-merciful, the overcomer of all things, hastened to tear out the contaminated flesh, and flung it to the ground. Thus originated the human navel. 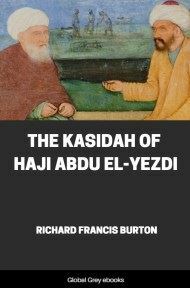 The piece of flesh, unclean by reason of the Evil One's spittle having defiled it, obtained new life from the dust, and thus, almost simultaneously with man, was the dog created--half from the human body and half from the Devil's spittle. Thus it is that no Mahometan will harm a dog, though he refuses to tolerate him in his house. The animal's faithfulness is its human inheritance, its wildness and savagery are from the Evil One. In the Orient the dog does not increase, for while the Moslem is its protector, he is at the same time its implacable enemy.